1. Preheat the oven to 180 ᴼC / 350 ᴼF. 2. Grease the baking tray for muffins with a little butter. This is not necessary if you use paper molds. If you use silicon molds, just rinse them with cold water (do not dry them). 3. Mix the butter and the sugar until it is a smooth mixture. Then, add the eggs one by one and mix well. Add the lemon zest and juice. 4. Sieve the flour, potato starch and baking powder and mix them through the butter mixture. Add the Greek yoghurt and mix everything together until it is a nice batter. 5. Fill up the molds or baking tray with a large tablespoon with the batter (filled for about 2/3). Bake the cupcakes in the oven for about 25 minutes. Use a skewer to check if the cupcakes are cooked. Stick the skewer into the cupcake, when it comes out clean the cupcake is cooked. 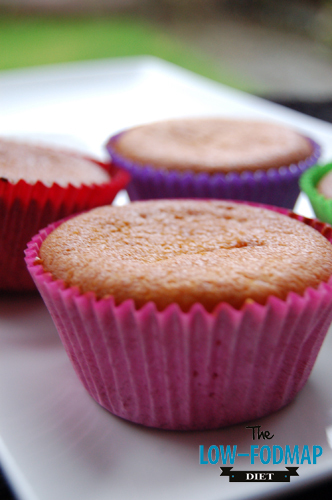 Tip: the cupcakes are suitable to freeze!